*Re-written to be clearer, using consistent terminology and more grammatically correct than original version ... the scoring system has been changed to reflect the best out of 3 sets winning the match, as the original 1-Set Match was found to be much too short and not as exciting. 1.1. The Court – The court is an area of 13.4 m, or 44 ft, long (divided into two equal halves of 6.7 m, or 22 ft) X 6.1 m, 20 ft, wide, free from all obstacles up to the height of 8 m, or 26.25 ft, measured from the floor surface, and free of all obstacles on the floor or ground up to a distance of at least 3.0 m, or about 10 feet, from the edges of the court all the way around. These “Sand Particle” size requirements allow for excellent drainage and must be considered in order to have the best surface conditions possible in all types of weather. The Beach Sand must also be free of any organic material. Must NOT be acquired from a crushed rock source. The selection of the Sand Particle “Size” & “Shape” gradation must conform as closely as possible to the above table, and shall be controlled to a depth of 40 cm. 1.3. Sidelines and Baselines – The width of the sidelines (two sides) and baselines (two back ends) bounding the court should not be more than 0.05 m, or 2 inches, measured and drawn inward from the outer edge of the court measurements. 1.4. The Center Line – A Center Line of 0.05 m, or 2 inches, should be drawn across the centre of the court, from side to side, to divide the court into two equal halves. 2.1. The posts shall be 1.55 m, or 5 ft 1 inch (1.45 m, or 4 ft 9 inches, for women) in height from the floor and shall be sufficiently firm to maintain high net tension. They should be made from strong materials and shall not be more than 0.04 m, or 1 ½ inches, in radius. 2.2. Position of Posts – The posts shall be erected or placed firmly 0.3 m, or 1 ft, outside the sideline boundary and directly in line with the center line. 3.1 The net shall be made of fine ordinary cord or nylon with 0.06 m to 0.08 m, or 2 ½ to 3-inch, mesh. 3.2 The net shall be 0.7m, or 2 ft 4 inches, in height (top to bottom) and not shorter than 6.1 m, or 20 ft, in width (side to side). 3.3 Two net shall be edged on both sides along the sideline edges from top to bottom with 0.05 m, or 2-inch, tape, and shall be called Boundary Tape. 3.4 The net shall also be edged with at least 0.05 m, or 2-inch, tape on both sides along the top and bottom, and shall be supported by a fine ordinary cord or nylon cord that runs through the tape and is tightened at the posts. 3.5 The top of the net shall be 1.52 m, or 5 ft, in height from the floor at center court for men (1.42 m, or 4 ft 8 inches, for women) and 1.55 m, or 5 ft 1 inch, at the posts for men (1.45 m, or 4 ft 9 inches, for women). 4.1. 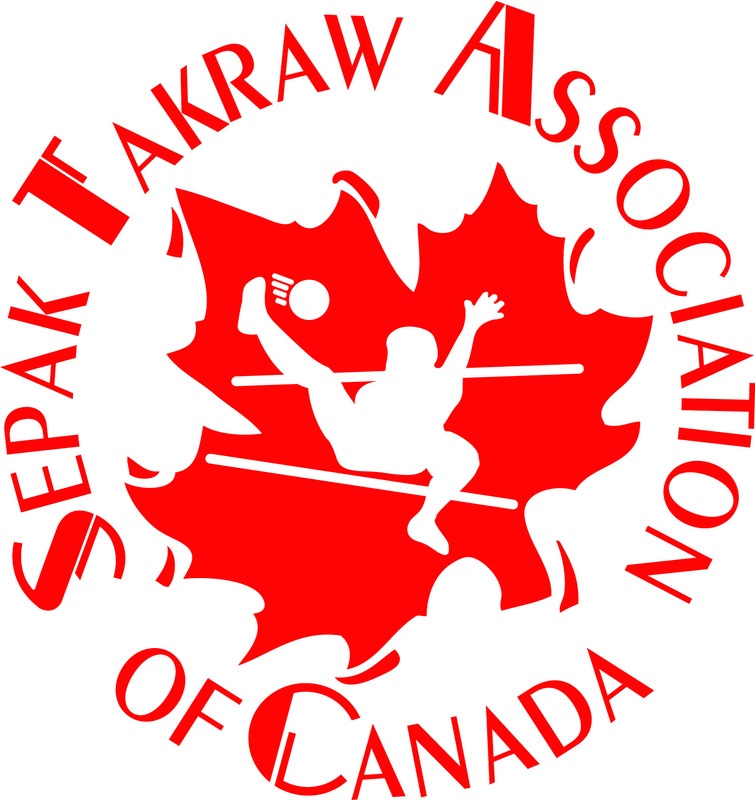 The Sepak Takraw ball shall be spherical, made up of one woven layer of synthetic fiber, or any other ISTAF approved materials, having 12 holes and 20 intersections. 4.2. For men, the ball circumference shall not be less than 41 cm, or 16.14 in., and not more than 43 cm, or 16.93 in. For women, the ball circumference shall not be less than 42 cm, or 16.54 in., and not more than 44 cm, or 17.32 in. 4.3. For men, the weight of the ball before play shall not be less than 170 g, or 6 oz., and not more than 180 g, or 6.35 oz. For women, the ball weight before play shall not be less than 150 g, or 5.3 oz., and not more than 160 g, or 5.6 oz. 4.4. The ball can be a plain singular color, multi-colored, or made of luminous colors, but not of any color that will impair the performance of the players. 4.5. All world, international, or regional competitions sanctioned by ISTAF, including but not limited to, the Olympic Games, World Games, Commonwealth Games, Asian Games, and South East Asian Games must be played with ISTAF approved balls – provided there is a fair, unbiased and transparent approval process. 5.1 Regu Event: Each Regu comprises of 4 players and 2 reserves. 5.2 Team Event: Each team comprises of 2 Regus (8 players and 4 reserves). 5.3 The player serving the ball shall position himself/herself behind the baseline of the court. Any one of the four players can execute the serve. 5.4 The other three players may stand anywhere in their respective court. 6.1. The players shall be allowed to wear anything besides jeans or long pants, as long as the attire is decent. It is forbidden for players to wear anything that endangers themselves or their opponents during the game. 6.2. Players shall not be permitted to wear earrings, chains, watches or any other form of accessories, and must take off such accessories before being allowed onto the court. 6.4. The entire apparel of a player is regarded as part of his/her body. 6.5. The Regu captain is identified with a marking of a “C” or wearing an armband on the left arm. 6.6. Anything that helps to speed the ball or movement of a player is not allowed. 7.1.1. Substitution of a player is allowed at any time upon request made by the Team Manager to the Official Referee when the ball is not in play. 7.1.2. Each Regu is allowed to make no more than 2 substitutions per set. 7.1.3. A Player who has been “sent off” by the Referee during a match, or a player who is injured, may be substituted, provided 2 substitutions have not already been made in the particular set. If BOTH substitutions had already been made, the Regu will not be allowed to continue and will be considered as having lost the match with the sent off/injured Regu’s last recorded points being their final score, while the winning Regu automatically scores 21 (first 2 sets) or 15 (tie break set), or whatever the winning score would have been if they were “Playing to 25 or 17”. 7.1.4. Any Regu having less than 4 players right from the beginning of their match will not be allowed to play and the match will be declared a forfeit in favor of the opposing Regu, with the recorded score being 21-0, 21-0. 7.2.1. Substitution of a player is allowed at any time upon request made by the Team Manager to the Official Referee when the ball is not in play. 7.2.2. Each Regu is allowed to make no more than 2 substitutions per set. 7.2.3. A player who has been “sent off” by the Referee during a match, or a player who is injured, may be substituted, provided 2 substitutions have not already been made in the particular set. If BOTH substitutions had already been made, the Regu will not be allowed to continue and will be considered as having lost the match with the sent off/injured Regu’s last recorded points being their final score, while the winning Regu automatically scores 21 (first 2 sets) or 15 (tie break set), or whatever the winning score would have been if they were “Playing to 25 or 17”. 7.2.4. Any Team having less than 4 players in a single Regu right from the beginning of their match will not be allowed to play and the Team Event match in question will be declared a forfeit in favor of the opposing Team’s Regu, with the recorded score being 21-0, 21-0. 8.1. Before commencing the game, the Court Referee will toss a coin or disc in front of the captains and the Regu winning the toss shall have the option of “Choosing Service” or “Choosing Side”. The Regu that loses the toss will abide with the decision. 8.2. The Regu being awarded with the “service” shall “warm-up” first for 2 minutes followed by the other Regu. Only 6 persons are allowed to move freely on the court during the warm up. 9.1. At the start of play, the players of both Regu's must be in their respective courts in a ready position. 9.2. The Tekong, or player who is executing the service, must have both feet outside/behind the base line. 9.3. The other three players shall be within their side of the court and remain in one spot, while the serve is being executed. 9.4. The opponent or receiving Regu is free to be anywhere within its court. 10.1. The Regu that serves first (according to the toss decision) shall start the first set. The side that wins the first set shall begin serving in the second set. 10.2. As soon as the Referee calls the score, the Tekong, or player who is executing the service, shall self-toss the ball up into the air and kick the ball over the net to the opponent’s side of the court. The ball can be kicked in any manner using the foot. If the Tekong throws the ball up for service before the Referee calls the score, it shall be re-thrown and a warning will be given to the Regu. A repetition of this act will be considered as ‘Fault’. The serve can be executed from anywhere along the baseline. 10.3. During the service, as soon as the Tekong kicks the ball, all the players are allowed to move around freely in their respective courts. 10.4. The service is valid if the ball passes over the net, whether it touches the net or not, and inside the boundary of the two net tapes and boundary lines of the opponent's court – as long as even the shadow of the ball (very outer edge) is directly over the tape or boundary line, it is considered in bounds. 11.1.1. The Tekong plays around with the ball (throwing the ball up, bumping it, giving it to the other players, etc.) after the score has been announced by the Referee. 11.1.2. Any of the other forward players steps on the centre line or crosses over or touches the net. 11.1.3. The Tekong’s foot touches the baseline or any other markings in the court before the kicking foot contacts the ball during the serve. 11.1.4. The Tekong does not KICK the ball on the service throw tossed up to himself/herself. 11.1.5. The ball touches the Tekong’s own player before crossing over to the opponent’s court. 11.1.6. The ball goes over the net but falls outside the court. 11.1.7. The ball does not cross over the net to the opponent’s side. 11.1.8. A player uses his/her hand(s) or arm(s) to facilitate the execution of a kick, even if the hand(s) or arm(s) do not touch the ball, but it touch other objects or surfaces before the ball is kicked. 11.1.9. For the second time during the same match, the Tekong of the serving Regu throws the ball up to himself/herself to execute the serve before the Referee announces the score. 11.2.1. Creating distracting mannerisms or noise or shouting at their opponents. 11.3.1. Stepping ON the centre line (under the net, that divides the two court in half), except during a follow through after an execution of a spike or a block. 11.3.2. A player touches the ball or touches an opponent on the opponent’s side of the net. 11.3.3. Any part of player's body CROSSES OVER into opponent's court, whether above or under the net, except during the follow-through after striking the ball from one’s own side. 11.3.4. Contacting the ball with more than 3 consecutive hits on one side. 11.3.5. The ball touches the arm or hand (except during the service throw). 11.3.6. The ball STOPS or STALLS on any part of a player’s body. 11.3.7. Any part of a player's body or a player’s attire, e.g. shoes, jersey, head band, etc., touches the net, post, Referee's chair, or any other object outside the court, or falls onto the opponent's side. 11.3.8. The ball touches any objects outside the court during play. 11.3.9. A player uses the aid of an external object as a form of support to facilitate the execution of a kick. 11.3.10. The ball does not cross over the net to the opponent’s side within 3 hits during play. 11.3.11. The all goes over the net within e hits but falls outside the opponent’s court during play. 11.3.12. A player intentionally delays the match unnecessarily. 12.1. Change of service is given when any fault is committed by the serving Regu, or when the receiving Regu successfully kills the return. 13.1. When either the Serving Regu or Receiving Regu commits a fault, a point and the next service is awarded to the opposing side that did not fault (do not have to be serving to score points). 14.1. A Match is played in two OR three sets with a 2-minute rest in between each set. 14.2. The winning point for a set is 21 points, unless the points are tied at 20-20, then the Set shall be decided on a difference of two points, up to a ceiling of 25 points. When the score is tied at 20-20, the Referee announces, “Playing up to 25 points”. 15.1 If each Regu wins one set of the first two sets, the match shall be decided by a third set called a “Tiebreak” with the winning points being 15 points, unless the points are tied at 14-14, then the Tiebreak Set shall be decided on a difference of two points, up t a ceiling of 17 points. When the score is tied at 14-14, the Referee announces, “Playing up to 17 points”. 15.2 Before a Tiebreak Set takes place, the Referee shall toss a disc or coin, and the Regu winning the toss shall serve first. The change of sides takes place when one Regu reaches 8 points. 16.1. An automatic 1-minute “Time-out” will be given to each Regu in the first two sets when one Regu reaches 11 points. During the Tie Break set an automatic 1-minute “Time-out” will be given to each Regu when one Regu reaches 8 points. During the time-out, player must go outside the court, behind the baseline. Only 6 persons are allowed behind the baseline during a time-out. 16.2. The 6 persons behind the baseline should consist of the 4 players who were just playing the game and two other persons, such as coach and manager, who are dressed differently than the players. 17.1 The Referee can suspend play temporarily in the event of obstructions, disturbances or any injury to a player who needs immediate treatment, for not more than 5 minutes for each Regu in a Match. 17.2 An injured player is allowed up to 5 minutes injury time-out. If after 5 minutes the player is unable to continue, a substitution must be made. If the injured player's Regu has already made a substitution, the match will be declared a forfeit in favor of the opposing Regu, and the injured Regu’s last recorded points being their final score while the winning Regu automatically records a sore of 21 (first two sets) or 15 (tie break set), or whatever the winning score would have been if they were “Playing to 25 or 17”. 17.3 In the event of obstructions, disturbances or any other matters, only the Official Referee can suspend play upon concurrence with the Tournament Committee. 17.4 In the course of such suspension of play, all players are not allowed to leave the court to receive drinks or any form of assistance. 18.1 Every Player, Regu, Team and Coaching Staff must abide by the rules of the game. 18.2 Only the Captain of a Regu is allowed to approach the Referee during a match, when the ball is not in play, for matters either relating to the position or condition of a player in the Regu, or to ask for a reasonable explanation of a decision made by the Referee concerning the match, for which the Referee must accede to the request made by the Captain. 18.3 However, Coaches, Team Managers, Players and/or Team Officials are not allowed to dispute the Referee's decision during the match or act in any way that will jeopardize the continuity of the match, for which such act shall be regarded as a serious Disciplinary Offence. 19.1.6. Deliberately leaves the court without the referee's permission (except during regular play). 19.2.5. Receives a second caution (Yellow Card) in the same match. 19.3.2. Offence: The same player receives a SECOND Yellow Card in different Matches but in the same tournament. 19.3.3. Offence: The same player receives a THIRD Yellow Card, after a Match suspension has been served for the first two Yellow Cards received, in the same tournament. Penalty: Two-match Suspension, plus a US $100 Fine that must be paid by the club or any other body the player represents in the competition. 19.3.4. Offence: The same player receives a FOURTH Yellow Card, after having served a two-match suspension for the earlier third Yellow Card, in the same tournament. Penalty: Immediate suspension from playing in the next and all subsequent matches in any tournament sanctioned by the relevant Sepak Takraw controlling authority until a Disciplinary Committee has convened to reach a final decision on the matter. 19.3.5. Offence: The same player receives TWO Yellow Cards WITHIN THE SAME MATCH. Penalty: Two-match Suspension, plus a US $100 Fine that must be paid by the club or any other body the player represents in the competition. A Red Card will be given for a third disciplinary offence committed in any other subsequent match in the same tournament. Penalty: Sent OUT of the Match and immediate suspension from playing in any tournament sanctioned by the relevant Sepak Takraw controlling authority until a Disciplinary Committee has convened to reach a final decision on the matter. 20.1. Disciplinary action will be taken against Team Officials or his/her Regu/Team for any misconduct or disturbances committed by the official or Regu/Team during a tournament, whether in or outside the court. 20.2. 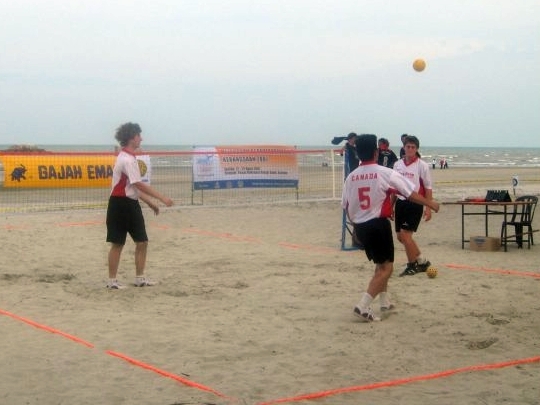 Any Team Official who commits a misconduct or disturbances will be immediately escorted out of the arena by the Tournament Officials and the Official Referee, and will also be immediately suspended from being a Team Official by the relevant Sepak Takraw controlling authority, until a Disciplinary Committee has convened to reach a final decision on the matter. 21.1. In the event of any question or any matter arising out of any point, which is not expressly provided for in any of the rules of the game, the decision of the Official Referee shall be final.